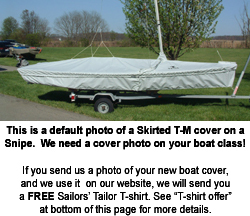 Daysailer Skirted Trailing/Mooring Cover -- One Design Sailboat Covers -- The Sailors Tailor, Inc.
Full deck cover to use for both trailing and mooring. Lies flat over the deck for trailing and can be drawn up for water runoff while mooring. Has 5/16" elastic shock cord in the hem to hold 6" under the rub-rail, tie-down points, heavy duty nylon zipper, mast collar with drawcord closure, and flaps that snap around stays. Reinforcements are at back corners, fairlead areas, cleat areas, and splashrails. Does not fit over the boom when boom is in crutch with mast up. Store boom in cockpit. To use cover over the mast for trailing requires that the mast be no higher than 10" to 12" above the deck where the mast steps and no higher than 3" above the transom. Has a skirt to protect the sides, transom, and bow from fading or chalking in the sunlight. Skirt has flaps which snap around side stays, velcro closure at bow, and drawcord in the hemline.